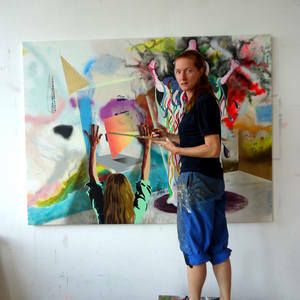 V&B (Alex Jacobs and Ellemieke Schoenmaker) is an artist duo live and work in Rotterdam, The Netherlands. Winners of the AVRO television show 'In search of the New Rembrandt', The Netherlands. Winners of the Royal painting prize presented by her majesty Queen Beatrix, The Netherlands. Nominated for the Charlotte van Pallandt sculpture prize, The Netherlands. Design for 3 coins, Ministry of Finance, Den Haag, The Netherlands. Design of a 5 euro coin, Ministry of Finance, Den Haag, The Netherlands. In their paintings, sculptures and installations they often comment on the (art)world using self-mockery. The work combines historical references with borrowed elements from the media and popular culture. Both spontaneous inspiration and critical interest reveal unexpected combinations that invite the viewer to find commonly missed relations.